This is the lament of Hacienda Luisita farmers while Cojuangco-Aquino minions are still currently attempting to completely dismantle the bungkalan or land cultivation areas in Barangay Mapalacsiao, Hacienda Luisita. The bungkalan campaign, which started during the height of the Hacienda Luisita strike in 2005, is spearheaded by the Alyansa ng mga Manggagawa sa Asyenda Luisita or AMBALA, the same farmworkers organization which petitioned for land distribution and the revocation of the oppressive Stock Distribution Option or SDO in the controversial sugar estate. UMA Secretary General Danilo Ramos said that from November 25 up to the present, Cojuangco aides Buena Timbol and Brgy. Capt. Edison Diaz of Lourdes (Texas) have allegedly sent local constituents and thugs to Mapalacsiao to set-up farm sheds and threaten Mapalacsiao farmers that their crops would soon be destroyed. As local government official, Diaz has been using the claims of farmworker-beneficiaries (FWBs) in his barangay to justify the clearing and demolition of huts in the bungkalan areas in Mapalacsiao. The FWBs in both Lourdes and Mapalacsiao were dislocated and disenfranchised by BS Aquino’s fake land distribution via tambiolo and the rampant aryendo or illicit leaseback agreements. “These ploys ultimately seek to create an atmosphere of chaos among farmworkers, discredit AMBALA, and to justify and effect the reconcentration of lands back to the control of landlords,” emphasized Ramos. Diaz, Timbol and other known Cojuangco minions such as former Hacienda Luisita, Inc. (HLI) supervisor Arsenio Valentino, Tarlac Development Corp. (TADECO) Chief Security Villamor Lagunero and “kabarilan” Virginia Torres (now deceased) have been involved in the violent eviction of farmers and destruction of crops in Hacienda Luisita since 2013, coinciding with BS Aquino’s bogus land distribution scheme implemented via tambiolo or lottery raffle. Today, AMBALA reported that Diaz is mobilizing masked goons armed with bolos to forcibly claim lands awarded to Lourdes FWBs by the former Department of Agrarian Reform (DAR) leadership. AMBALA says that Diaz is eager to claim the area to replant sugarcane for the Cojuangcos and honor the illicit lease agreements he brokered with financiers. This is not for the benefit of disenfranchised FWBs, some of whom they have coerced to fight with AMBALA members, but to cater to economic interests of the Cojuangco-Aquinos and other land speculators. Several violent incidents have been reported in the same area from 2014 up till the last part of the BS Aquino administration in 2016. These include illegal arrests and detention of farmers and destruction of crops and property. Aggrieved farmers were then slapped with trumped-up criminal charges in local courts and complaints before the Aquino-controlled DAR. All these harassment suits, however, have since been junked by the respective government institutions. While there are no longer any fabricated cases against AMBALA members in Mapalacsiao, it is worthy to note that the rabid Cojuangco aide Diaz has a pending criminal case for destruction of crops and property before the local Regional Trial Court. It is also worth mentioning that AMBALA members and victims have filed complaints against perpetrators of these atrocities at the Department of Justice (DOJ) main office in Manila in October 2014. These complaints however have been gathering dust at the DOJ. AMBALA also fears that the local police force based in Tarlac City and with a community precinct in Mapalacsiao, will still work in favor of the Cojuangcos, since they have been traditionally deployed in the area to quell farmworkers’ protests against the landlords. “This is why we are calling on the Duterte administration to take concrete action in Hacienda Luisita. The extent of BS Aquino’s atrocities should be thoroughly investigated so that the bogus tambiolo land distribution scheme implemented by the previous DAR would be nullified and rectified. The rampant aryendo and sale of farmlots should also be stopped. The Cojuangco-Aquinos and their minions must pay for all their crimes,” said Ramos. 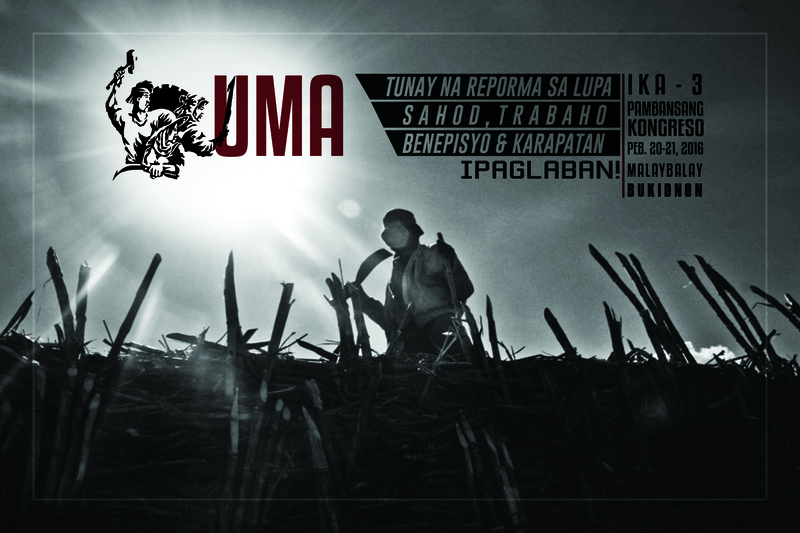 “Luisita should no longer be used in the murderous political squabbles of the ruling elite. This is not about the Marcoses or the Aquinos – this is about the welfare and interests of farmworkers long-oppressed by oligarchs since the Spanish colonial period. There can be no peace without justice,” ended Ramos.